Four women and a fella – the $60 million redevelopment of Armidale Rural Referral Hospital is officially underway and turning the first sod today were planning director Rebecca Wark, left, Parliamentary Secretary for Regional and Rural Health Sarah Mitchell MLC, Northern Tablelands MP Adam Marshall, HNE Health executive Susan Heyman and Armidale Hospital general manager Wendy Mulligan. HEALTH officials, builders and infrastructure designers, planners, staff and community leaders were at a ceremonial sod-turning today in Armidale to officially launch the construction of the $60 million redevelopment of the Armidale Rural Referral Hospital. 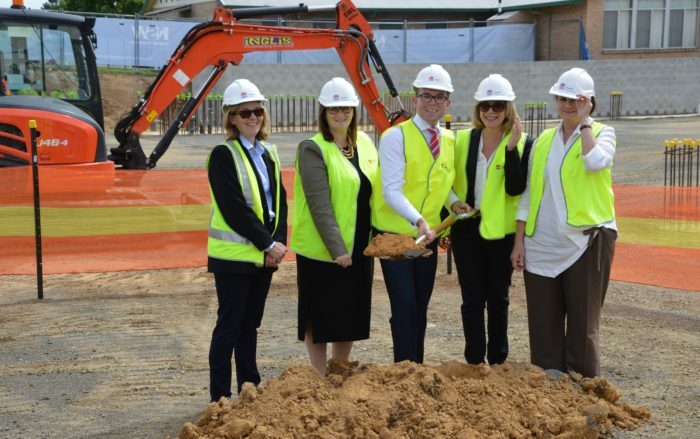 Northern Tablelands MP Adam Marshall welcomed the ceremony as the starting point of a redevelopment that will see a brand new four-storey building to and a refurbished reconstruct of some of the wards and health areas of the old hospital building. A spokesman for the contracted builder Richard Crookes Constructions said while some earthmoving and site preparations had already been completed, actual work by building trades gets underway in earnest on Monday. Mr Marshall joined key hospital project executives today to shovel the first soil in the traditional sod-turning and mark the moment. “The community has campaigned hard for this redevelopment, which will revolutionise health care in our region and cater for our health needs not just for now, but for the next 20 to 30 years,” Mr Marshall said. “The redevelopment will complement the University of New England Tablelands Clinical School and the Ambulatory Care and Chemotherapy building to make Armidale a world-class regional health precinct. Mr Marshall said the new four-storey building will house the hospital’s new emergency department, new critical care unit, new in-patient ward, new operating theatres and a new sterilising unit. Among those at the ceremony today were Rebecca Wark, the senior project director with Health Infrastructure. Ms Wark has played a leading role in delivering the design, in consultation with Armidale hospital professionals, and was proud of the part she played – particularly from a personal point of view. She can count some seven generations of Armidalians in her family, and her parents were there to see the ceremony too. “I’ve been working on this project for a couple of years and I’m looking forward to delivering a better hospital with new models of care,” Ms Wark said. Susan Heyman, the executive director for rural and regional health services, said Armidale staff, on average, handled over 4,000 hospital presentations every three months and serviced a community of 150,000 people across the region. Mr Marshall said the new building was expected to be completed in late 2017 and the refurbishment some months after that.